There is support at $776 and strong support at $750. We continue to belief that any sell off will be short and that gold will end 2007 above $800 per ounce before making new record highs early in 2008. Extremely counterintuitive trading in the gold market continues. Ostensibly the gold sell off was due to dollar strength on the encouraging retail sales data. But with news of the worst producer-price inflation since Richard Nixon was president and imposed price controls in 1973, inflation surging in the US and internationally and the property and credit crisis deepening, gold would normally soar. Yet it sold off some 2% yesterday. US inflation at a 34-year high rate of 3.2% in a slowing US economy and serious credit crunch is very gold bullish. The 7.2 percent increase in producer prices from November 2006 was the largest 12-month gain since November 1981. Gasoline prices rose 34.8 percent in the month, eclipsing the previous record gain of 28.8 percent in April 1999. Prices for all energy goods also rose by a record 14.1 percent, surpassing the previous high of 13.4 percent recorded in January 1990. Further confirmation of surging international inflation was seen in the CRB Commodity Index surging 5.42 to a new record high of 470.73. These are very stagflationary conditions as they were in the 1970's. Short term gold players seem to have a hold of the market at the moment. The quants and black box algorithm traders in large hedge funds and financial institutions speculating long and short are about maximising short term trading opportunities (based on complex mathematical and statistical modeling, measurement and research) rather than value investors or safe haven investors. However, they can influence the price in the short term. But this sell of will be another short term dip as the paper players can only artificially surpress the gold price in the short term. Given the extremely favourable supply and demand fundamentals of gold, it is akin to a large beach ball being pushed under the water and held down. Eventually the fundamental supply demand imbalance will dictate higher prices. When that happens the beach ball surges up out of the water and the more it is pushed under the water the greater the move to the upside. Large buyers in Russia, the Middle East, China, India, wider Asia and internationally will ultimately dictate the price and not the short term speculative players. The money spigots are wide open with unprecedented credit creation and the huge financial deficits facing the US remain with November Budget Deficit coming in at $98.2 billion. The federal budget deficit for November was up a very sharp 34.5% compared with a year ago. The Commerce Department said the trade deficit for October increased to $57.8 billion, the highest level since July, boosted by high oil prices and Chinese imports. The trade deficit has only improved marginally and remains near record levels month on month and now the federal buget deficit is deteriorating. 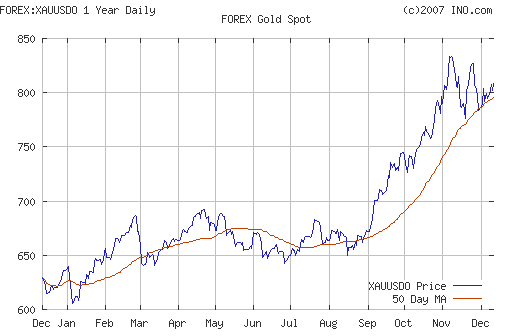 Fears regarding the US economy and the US dollar will lead to safe haven buying which will alomost definitely drive gold to new record highs in 2009. Silver is trading at $14.00/02 at 1200 GMT after yesterday's sharp sell off. Platinum was trading at $1458/1464 (1200 GMT). Spot palladium was trading at $346/350 an ounce (1200 GMT).